-Day hike in the Pyhä-Luosto national park. Includes : guide service, car/taxi transport from Luosto to the national park (if needed), good outdoor meal by the fire in a forest camp, and beautiful arctic landscape all the time. scroll down for more information about the program! -Evening walk under the midnight sun. Include s: guide service, car/taxi transport from Luosto to the national park (if needed), snacks and drink on the way. This hike is the ideal way to discover the different ecosystems of Lapland in the automn, at a quiet pace. the whole hike is about 10 to 15 km long (on agreement), and we are mostly following hiking trails and using duckboards when crossing wet areas (so regular hiking boots are enough). I pick you from the location of your choice in Luosto at 9.30, and we will drive to the national park (10-15 min drive) where we will start our hike. We will discover the old boreal forest, go through arctic peatlands and swamp areas, and drink the pure water from clear forest streams whenever we feel thirsty. We´ll stop for a meal around the fire in a forest camp. The menu will be grilled meat (beef entrecôte) , potatoes in folio with parsley butter, with a glass of crowberry wine. For dessert, we have fruit, traditional pastry and coffee. On the way back, we will have the possibility to climb over the tree-line in order to have a look at the incredible lappish panorama from above. The whole trip lasts around 5 hours (depending on our walking speed, and the length of our photo breaks! ), and i will drop you back to your accomodation by car or taxi. INCLUDES : Private guide service, car transport, lunch around the fire, snacks on the way. 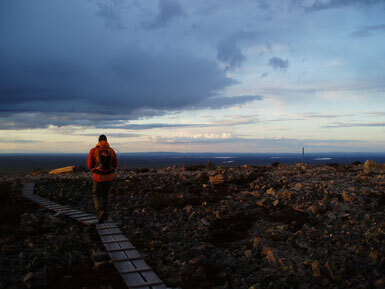 There is no better way to eperience the arctic nature than to take a relaxing evening stroll to the top of the local fells in order to enjoy the sunset over the Lappish landscapes! I meet you in Luosto, between 20.00 and 21h00 (on agreement), and we start to walk to the Pyhä-Luosto national park. 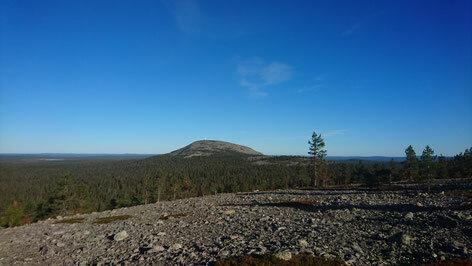 Our trip will take us all the way to the top of Ukkoluosto, the local fell. From there, we can see 80km away in all directions! The walk to the top lasts around 1 hour if we take our time (the walk is not difficult, but the path is rocky and little bit steep from place to place, so good shoes are required). Once on the top, we just find the best place to enjoy the sunset or walk quietly around, in the hope to see some arctic wildlife (grouses, arctic hares, and many animal species are more active in the evening...). We'll also enjoy some delicious berry juice and a few cookies before going back down "to the civilization"!